Forsaken World – Free MMORPG – Tytan's Gift Promotion! The blessings of Tytan are with you! For the first time ever, Tuytan himself will grant you a Raptorex Crystal box to anyone that transfers ZEN to any Forsaken World server! From 4/27/2011 6:10PM (PDT) till 5/5/2011 11:59PM (PDT), for every 1,000 ZEN (Up to 10,000) transferred to a Forsaken World server, you will be rewarded with a Tytan's Gift to any character on your account! 1. Charge ZEN by visiting the billing page. 2. Transfer atleast 1,000 ZEN to any Forsaken World server. 3. View your current eligible reward by visiting the rewards page. 4. 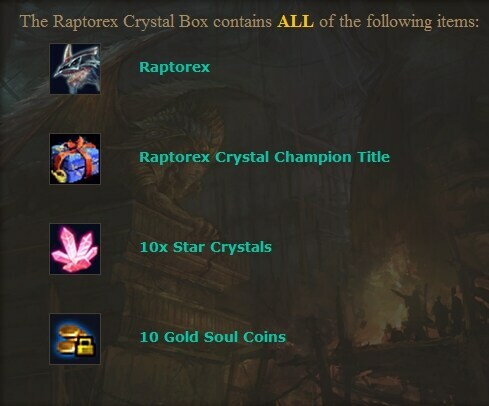 If you've transferred atleast 1,000 ZEN, you will be able to send a Raptorex Crystal Box to any character on your FW account! You can repeat this up to ten times, for a total of 10,000 ZEN transferred - it should take approximately an hour for the box to be mailed to you. 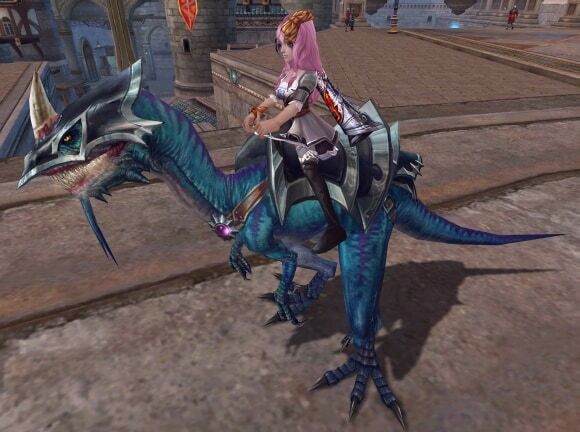 The Raptorex all-class general mount! This mount will last 15 days, and has a ground speed of 135%. 10 Star Crystals (a 520 ZEN value), used to fortify your level 40+ gear! 10 gold worth of bound Soul Coins. The exclusive Raptorex Crystal Champion title! - This promotion will only run until 5/5/2011 11:59PM (PDT). - You have until 5/12/2011 11:59 PM PDT to claim your rewards. Get in on the ground floor of this promotion while it still lasts! Check out the event page here, and visit the billing page to get started!